Congratulations.... because you're just one step away from a complete and proven Blueprint for any serious and determined solicitor who's sick and tired of working ever longer hours for less and less reward. It's called The Solicitor's Guide to Marketing and Growing a Business and it is a unique guide to marketing and business development for legal professionals. In the book I share with you practical ideas that have been tried and tested in a real modern solicitor's practice in ways that have been recognised as among the very best nationally and internationally. These ideas can work for you too and with this book you can use them to turn your legal practice into a financial success. And it's yours for just €24.97 plus €7.97 postage and packing within the Republic of Ireland: that's €32.94 in total. To claim your copy of The Solicitor's Guide to Marketing and Growing a Business click the button below and follow the simple on-screen instructions and I'll get your copy to you as quickly as I can. It’s really practical and current. It gives you a short-hand so that you don’t have to go out and invent the concepts for yourself; Flor has captured all of them in his book. All of the messages in the book about practice management are extremely good. It’s very attuned to the practical business of doing law as you would expect from Flor. It’s beautifully put together, very well written and very attractive in terms of its concepts. It is good to see the optimism that’s in this book and the possibilities that it holds out. It will be extremely useful and very helpful to people in the business. Law has to be a business, and it's about what the clients want ... Running a successful legal practice isn't just about knowing the law - modern firms must also manage and market their businesses to be successful. Flor's guide, and it is a guide in the best sense of the word, is simply of a different calibre. It is a guide for practising solicitors in small firms by a solicitor in a small firm. Almost every sentence in this book is relevant to solicitors seeking to better manage smaller practices. Flor has done the solicitors' profession some service and he's only getting started. 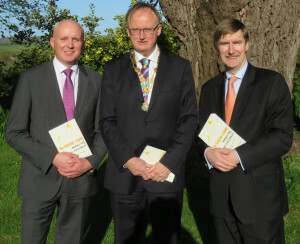 I believe that Flor has created a unique and very important road map to help small and medium-sized law practices throughout Ireland to navigate their practice into creating success in their business. He uses common sense business strategies to challenge you to reposition your business in order to increase profitability... This is one manual you can’t do without, and you will refer to time and time again. I have been a big advocate of having well-run SMEs. Law firms are no different. Flor sets out the essential message early. Running a law firm is not about just practicing law, it is running a business. Everyone expects trained lawyers to be able to deliver legal services well. It is how well they do the rest that defines who will flourish and who will not. In a clear and readable way, Flor presents the how-to manual for achieving success. Any solicitor setting up or managing a firm who says “Na, not for me. That’ll never work in my practice.” will I think be making a big mistake. It is! It should be mandatory reading before leaving Blackhall Place! My only concern is that, given the title, managers running other types of service firms will not realise that they should read this book too. The magic trick of a book helping lawyers market better that is actually interesting and a delight to read is one YOU must see for yourself. Flor McCarthy delivers. This is the ONLY manual you need to grow a successful and profitable small law firm. This is a unique and invaluable guide to marketing and business development for solicitors. Every solicitor should read it and, more importantly, act on the ideas contained in it. In America the solo and small firm attorney has been under attack for years. Regulations, lots of firms willing to spend large sums of money on marketing and a general public distaste for lawyers has made practice for the small firm lawyer very difficult. For almost a decade I’ve lead a group of solo and small firm attorneys here in America who, despite the odds, are not only surviving but thriving. 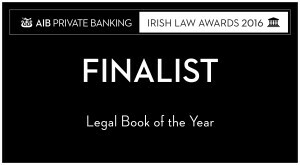 Ireland will be no different and Flor McCarthy’s book provides a roadmap to survival and success for the small firm solicitor. An excellent and very readable book that will inspire and stimulate ideas – an invaluable source of innovative common sense. I wish I had had Flor McCarthy as my mentor and guide in my law practice. His powerful book, chock full of cutting-edge tools and strategies, will transform your business and your life. If you want to enjoy the exponential success of a deeply satisfying practice, this is a must read. Flor is a trailblazer in the unstirring meadowlands that most small firm lawyers inhabit. The legal services world is changing and there is no going back. Any small firm lawyer who wants not only to survive but thrive in this brave new digital High Street should use Flor’s book as a blueprint for their law firm. Flor will guide you, in his effortlessly easy-on-the-eye prose, and reveal how you can look after, protect and attract new clients to your law firm by using tried and tested “in the trenches” modern marketing techniques which weren’t (and still aren’t) taught to you in law school. Using both his heart, imagination and adding a bit of law and social media, Flor has delivered a brilliantly written book sharing real, practical and important social, business and lifestyle tips to the reader. Want to learn how to grow your law practice while also improving the quality of your life? Brilliant. Every law student should be given a copy and told read this and then decide whether you really want to be a solicitor. Every solicitor should read it. Brilliant does not go far enough. The Solicitor's Guide to Marketing and Growing a Business should be mandatory reading for all lawyers whether you are just starting your own law business or a seasoned lawyer. From mindset principles that are crucial to your success to proven strategies for website marketing that work, this book is full of invaluable advice. This book has the power to change the way you practice law. We have only felt the first fluttering of the butterfly wings of climatic change that the legal ecosystem is about to experience. The Solicitor’s Guide to Marketing and Growing a Business peppers you with many ideas, strategies and tools which should give you the confidence in this digital age and robotic era to transit from a traditional lawyer to an entrepreneurial lawyer whilst assisting you in the inevitable new role you may wish to consider in the current changing dynamics of the legal services industry. I have no doubt that when you embrace artificial intelligence, robotics and entrepreneurism with the changing dynamics, along with the skills needed to market and rain-make in these disruptive times, which this author shares, you will indeed succeed in Turning Your Legal Practice into a Financial Success. I wish you all every success! 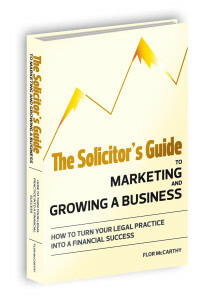 This book is a practical step by step guide to marketing and enhancing your business as a solicitor. It is full of tips and useful information which can be used to get your message across. For the small to midsize law firm, legal marketing is a place of increasing bewilderment. Opportunities recognised only after they ceased to be one, money wasting possibilities in abundance, and above all the siren call of the digital sales pitchers. Into this world without maps comes lawyer Flor McCarthy. His book fizzes with light bulb ideas. Do yourself a favour. Pick one or two, work them relentlessly, and watch your law business grow and prosper. In my view, it is the most practical and useful book on legal marketing/practice management that I have read. I say this for two reasons. Firstly, it is written by a practical practitioner and secondly because Flor has adopted a very generous approach of sharing his ideas/secrets with the reader. In essence the book goes beyond the theory that most books begin and end with and delves into the practical step by step approach necessary to implement the ideas set out in each chapter. It is compelling. The platform for change of mind set delivers a strong personal message at a gallop. It feels like the author is bringing us as readers into a secret Aladdin’s cave full of treasure that no one has access to. The imagery is convincing. The book is a must read for any solicitor in practice today who is serious about being in practice tomorrow. Unputdownable!! An amazing compendium of knowledge and analysis to bring the legal profession kicking and screaming into the 21st Century. Flor has successfully brought a lot of disparate thinking into a cohesive manual for the modern practitioner in a way that’s accessible and, dare I say it, easy to read. “It’s not about you” is the justifiable mantra – we are service providers and so we need to pitch ourselves accordingly – understand what the customer needs and tailor our services to meet them. There’s loads here for the private practice practitioner, but so much of it is relevant to the in-house lawyer where the challenge of being relevant and adding value can often be starker. Flor McCarthy has tackled the elephant in the room in the solicitors profession. For many firms, marketing is a dormant website and anything else is anathema. Flor has taken Marketing 101 and adapted it for lawyers. In a modern legal profession where parchments have been placed by computers and legalese is increasingly overtaken by plain English, marketing and selling ourselves is one of the last taboos that the smaller, traditional firm has to banish. This excellent guide is an essential tool for those who still believe marketing is only for big firms.